Olive oil is among some of the healthiest fats to incorporate into your diet, and extra virgin olive oil is the most coveted among olive oils. Unfortunately, many of the oils on store shelves today are cut with low-grade vegetable oils, flavored and colored with plant extracts . In two studies the UC Davis researchers tested a total of 186 extra- virgin olive oil samples both imported and domestic using standards established by the International Olive Council (IOC), as well as olive oil analysis used in Germany and Australia. The study concluded that 69 percent of imported and ten percent of California-based olive oil labeled extra-virgin did not pass International Olive Council (IOC) and US Department of Agriculture sensory standards for extra virgin olive oil. * Find a seller or manufacturer who stores it in clean, temperature-controlled stainless steel containers topped with an inert gas such as nitrogen to keep oxygen at bay, and bottles it as they sell it. Ask to taste it before buying. * Favor bottles or containers that protect against light, and buy a quantity that you’ll use up quickly. * Ensure that your oil is labelled “extra virgin,” since other categories-“pure” or “light” oil, “olive oil” and “olive pomace oil” – have undergone chemical refinement. * Try to buy oils only from this year’s harvest – look for bottles with a date of harvest. Failing that, look at the “best by” date which should be two years after an oil was bottled. * Though not always a guarantee of quality, PDO (protected designation of origin) and PGI (protected geographical indication) status should inspire some confidence. * Some terms commonly used on olive oil labels are marketing tactics, such as “first pressed” and “cold pressed”. Since most extra virgin oil nowadays is made with centrifuges, it isn’t “pressed” at all, and true extra virgin oil comes exclusively from the first processing of the olive paste. 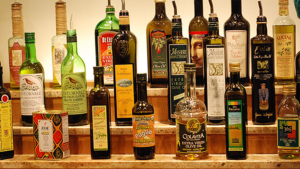 * Always store olive oil in a tightly sealed opaque glass bottle inside a dark, cool cabinet. Article adapted from Real Farmacy.